Product categories of Furniture and other Aluminum Die Casting Mould, we are specialized manufacturers from China, Furniture Aluminum Die Casting Mould, Furniture Die Casting Mould suppliers/factory, wholesale high-quality products of Custom Furniture Die Casting Mould R & D and manufacturing, we have the perfect after-sales service and technical support. Look forward to your cooperation! Furniture refers to movable objects intended to support various human activities such as seating (e.g., chairs, stools, and sofas), eating (tables), and sleeping (e.g., beds). Furniture is also used to hold objects at a convenient height for work (as horizontal surfaces above the ground, such as tables and desks), or to store things (e.g., cupboards and shelves). Furniture can be a product of design and is considered a form of decorative art. In addition to furniture's functional role, it can serve a symbolic or religious purpose. It can be made from many materials, including metal, plastic, and wood. Metal furniture is a type of furniture that uses metal parts in its construction. There are various types of metal that can be used, such as iron, aluminium, and stainless steel. Aluminum is a light and corrosion resistant metal,and to take advantage of these qualities, it is heavily utilized for stamped and cast furniture, especially in the category of molded chairs. Aluminum atoms form an outer layer of Aluminum Oxide, which prevents the internal aluminum from being corroded. Metal furniture is a popular choice of furnishings, especially used outdoors for decks and patios. However, metal furniture can also be used indoors, such as brass beds, brass tables, iron bakers racks and metal curio cabinets. 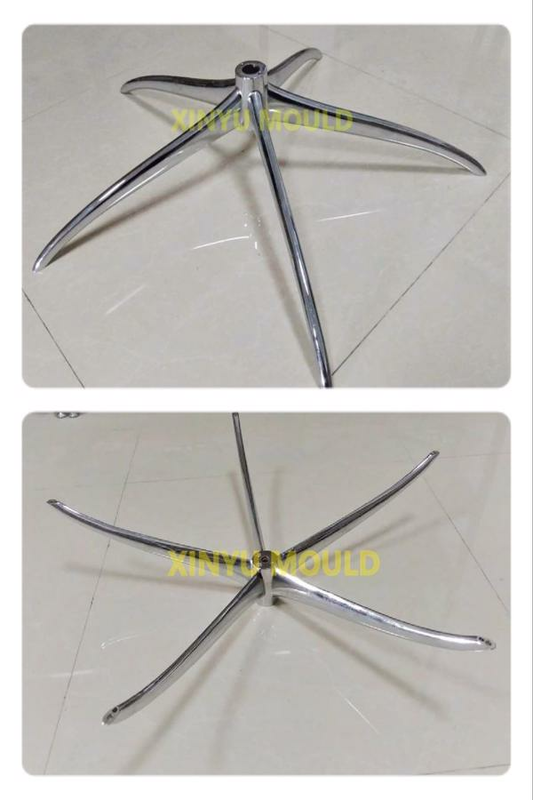 Besides being sturdy, metal furniture is attractive, giving a contemporary look to your home.Xinyu Mould manufacturing all types of aluminum casting furniture product HPDC dies and components.